Hats manuals for mechanics has no less than 31 workshop – Parts and Operation manuals all on one convenient CD rom primarily aimed at the mechanic trade but sequel suited to the hobby mechanic and engine restorer. It has a good selection of small engines across the Hatz range. These work out at just a few pence each. Self loading CD with good quality manuals. Hatz E 88 Parts Assembly manual. Hatz E 950 Workshop manual. Hats E 88 and E 89 Parts manual. Hats Service Data Sheets 2005. Hatz 4M and 4L Series Diesel engine instruction manual. Hatz 108 EZDV Parts manual. 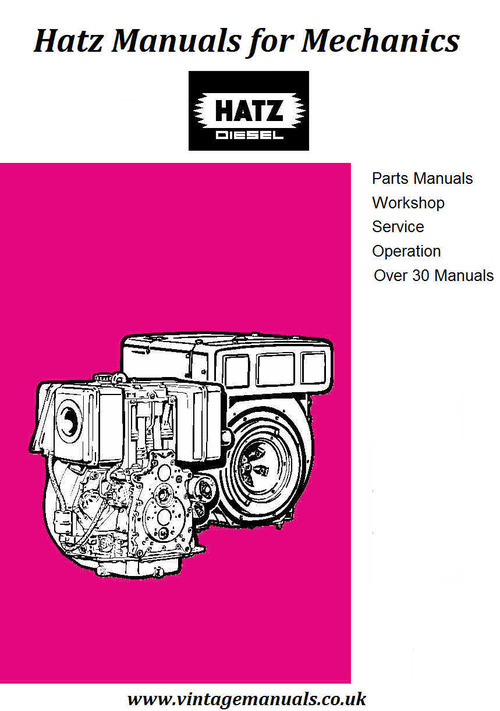 Hatz Diesel 1D 41 to 90 D operation manual. Hatz Diesel Parts manual 1B20_30. Hatz Diesel Parts manual 1B20_30_v p.
Hatz Diesel Parts manual 1B40 VW. Hatz Diesel Parts manual 1b40vw. Hatz Diesel Parts manual 1D 41 to 90. Hatz Parts and Operators gen set PMG 10 Series. All the work is completely re mastered and restored to this mechanics archive. This is a self running CD created using the acclaimed Auto Run Max software. Simply pop in your player it will load automatically. Then simply select the work you wish to view. Click and Go. You can print the page or the entire manual if you wish..
Hatz Manuals for Mchanics hatz manuals 276826161 14.95 richo Fresh Download Available!